Whether you're taking the first step towards school or passing out of the college, your life can be a total mess including assignments, surprise tests, homework, examinations, attendance and so on. All you do is wake up early, go to school and come back. That becomes your routine cutting out the quality time to spend with your family and friends. How disheartening is that? With such a busy schedule and a massive number of deadlines to fulfill, it becomes quite challenging to keep track of homework or anything that has to be submitted on the next day. In such circumstances, a homework planner or organizer could be reliable to oversee and update you regarding the assignments, homework and other deadlines. Of course, it's a daunting task to look out for a suitable homework planner who can assist you with your regular tasks. School planner is a full-scale homework planner app that is designed mainly to pay attention to students so that they are well focussed about their career. This app has a pile of features ranging from simple features to ones that you can think of. 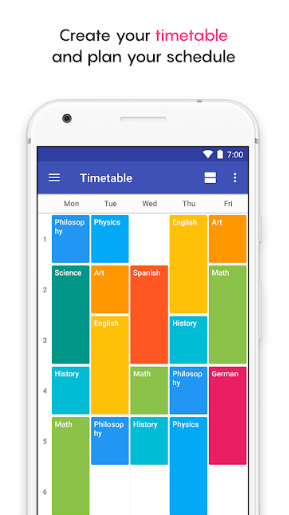 Besides your homework and timetable, school planner app assists you to keep track of your attendance. 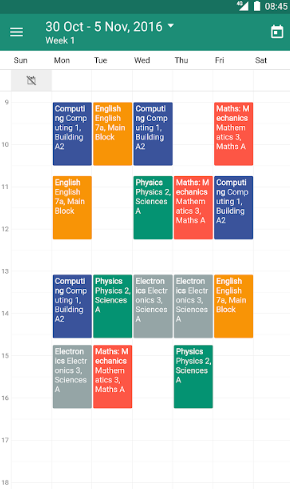 You can also add your teachers' contacts on the list, combine recorded lectures which could be beneficial during exams and add multiple planners too. Initially, it is a tedious job to use this app as you have to enter all your details in a form. In addition to your details, you must enter your teacher's details, timetable, and other college details. But once that's done, you're good to go! The app also supports backing up all the data that you feed in via Google drive, calendar, etc. This app does not fail to give you weekly reports, give reminders on the day of submission of assignments, attach snapshots to any reminders. Although the school planner offers a lot of features, it has the best performance with a beautiful framework. In case of your research paper you can use Edusson at affordable pricing. Istudiez pro is yet another student-friendly homework planner app and probably the oldest app when compared to all of the mentioned apps. 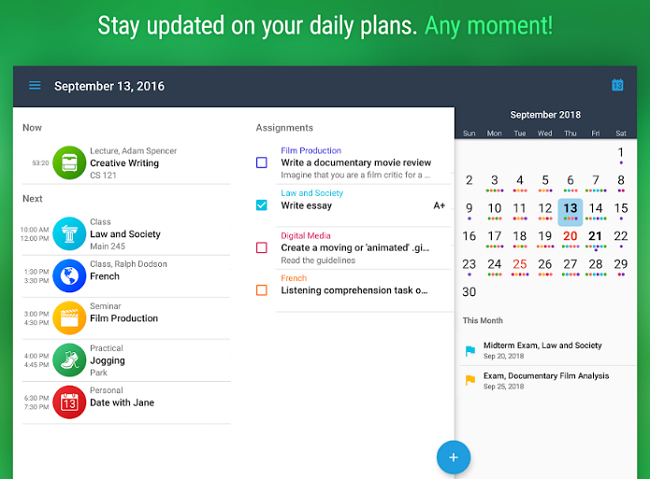 Like school planner, this app also offers a wide range of features including grading, attendance and subject wise organization of activities. It is way easier to set up when compared to a school planner. 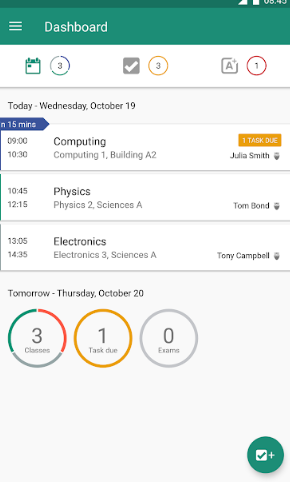 But the prominent feature in studies pro is that it is integrated with Google Calendar which gives you all the details like holidays, exam schedule, daily routine and so on. Not just that, it is also supported in all operating platforms like iOS, Mac, and windows. All the apps sync well and therefore you can operate this homework planner anywhere anytime on your laptop. 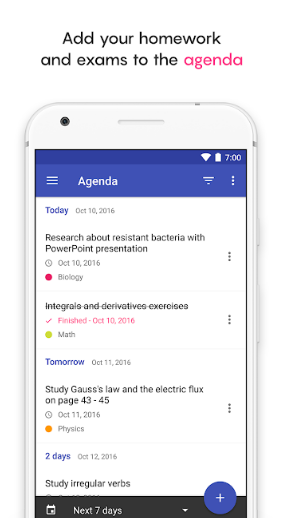 The next homework planner app for college students is My Study Life. The best thing about this app is that it has its web app which makes it unique. The web app can sync well(mostly on Android) therefore making your data accessible from any remote location using your device. Make sure that you've got a web browser installed in your device. This is a goal-oriented app and keeps reminding you about how much is completed and how much is left to achieve the goal. In addition to that, the calendar feature keeps track of all the important dates, it could be deadlines or project submission dates. The only con of my study life is that it is quite lengthy to set up. Once it is correctly done, you're all set! One of the smartest homework planner app for students is a chalkboard. It is pretty quick regarding its features and subject wise allocation of teachers on the app. When you open it for the first time, it prompts you to fill the name and subjects of all your teachers along with the timetable. Cool, isn't it? Although the setup process is a tedious job, it is entirely reliable and smooth. The amazing part is you don't have to memorize your timetable as you can see the upcoming classes on the home screen. Not just that, you can also find pending assignments and other tasks on the screen making your job way too easy. 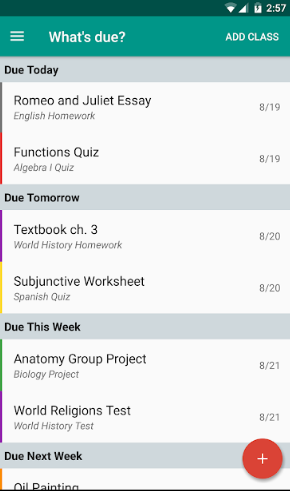 Features like these make this app stand out when compared to other homework organizer apps and gives you a great overall experience. This homework planner app would have been much more superior if it had a calendar feature in it. It's quite easy to set up Egenda when compared to others. All you need to do is, add the subjects and classes that you have. Once that is done, you have the choice of adding any homework, deadline, project or test. The pending tasks can be seen in the form of cards and have to be swiped away once it's completed. 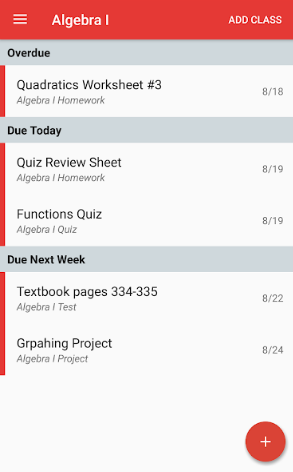 The best part about this homework planner app is that it keeps you updated, could be regarding the upcoming assignments, tasks or competitions. This will help you plan ahead and complete the job on time. Unfortunately, the app doesn't have a timetable feature. But in its latest update, you will find a calendar that can assist you in keeping track of dates. Backup option not available in this app, therefore data can't be recovered once you lose it. So these were some of the coolest homework planner apps exclusively for career-oriented students who want their tasks to be completed on time and who do not wish to struggle till the last minute to meet the goal. We genuinely understand your problem and these apps are going to be of great use to you!